Earlier this month we attended The Brewer's Plate 2012, a large tasting event at the National Constitution Center to benefit Fair Food. The local nonprofit works to bring locally grown food into Philly's markets and promote a humane, sustainable agriculture system for the region. A cause we strongly believe in. Brewer's Plate is an annual celebration of the Philadelphia region’s independent craft breweries, restaurants, farmers, and artisanal producers. 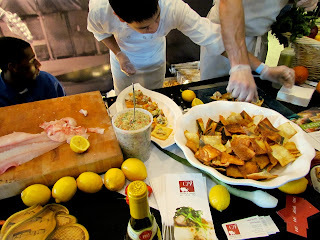 Under the tasting theme, each participating restaurant/food source prepares a small dish or dessert that is then paired with a local craft beer. It would be an understatement to say that we stuffed our faces with lots of great food and beer. Our favorite beer experience of the night was with Roy Pitz Brewing Company, who suggested mixing 75% of their Best Blonde Ale and 25% Ludwigs Revenge lager to make a "Dirty Blond." A+ for taste and spirit. 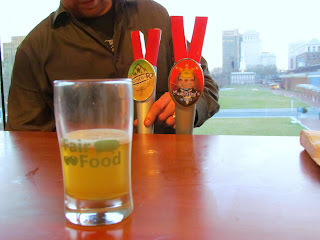 Fegley’s Brew Works from Allentown claimed Joe Sixpack named them best beer of 2010 for their Hop'solutely brew. We really liked the triple IPA and were even more amused by the name - it would be fun to bring to a party, both as good beer and a conversation piece. Prism Brewing Company in North Wales shared the hoppiest IPA of the night. The Farmer's Cabinet Artisinal Brewhouse had New Dawn Fade and Dark Farmhouse, both of which were decent but Bradd preferred the Farmhouse. McKenzie Brew House in Glen Mills served an average stout but the Saison was less appealing. 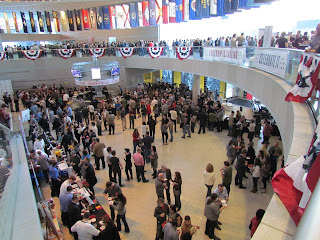 The hops and barley education hosted by Victory Brewing Company in the VIP area was a highlight. It included two beers brewed the exact same way, with the same hops but from different fields. You could definitely taste the difference. 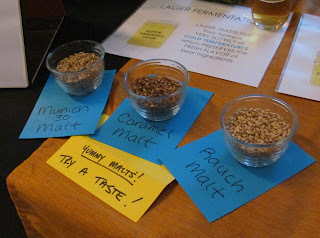 It makes you think about what a craft it really is to brew beer, and how many different varieties and ideas there are. Bradd wants to take a hops and barley class now to understand how varieties change the taste. Bar Ferdinand's lamb merquez was possibly the best dish of the night. Brauhaus Schmitz also served up smoked kraut and beer-cooked brats that were very good. London Grill made excellent Korean barbecue lettuce wraps that paired well with Weyerbacher, really bringing out the hops in their beer. 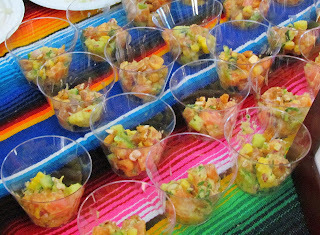 There were several ceviche dishes on display. 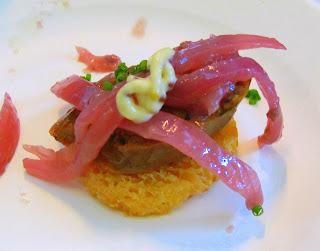 C19's fluke ceviche was solid; Cantina dos Segundos offered a spicy but good salmon ceviche. Rembrandt's took the traditional fish dish and instead made it out of tea smoked pork belly - very unique and quite tasty. Cantina dos Segundos also made a vegan chicken ropa vieja. We were surprised at the nice texture of the seitan it was made of because we're usually turned off by the texture of many seitan dishes. Pork was a common ingredient across the floor. 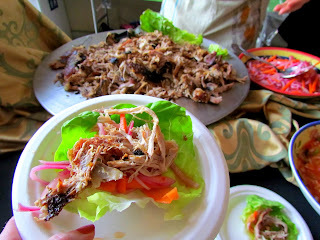 Country Time Farm from Hamburg made a great roast pig sandwich and El Camino Real's BBQ pork was also great. 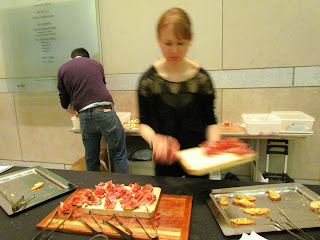 Tria shared two of their usual delicious small plates of meat and cheese bruschettas. 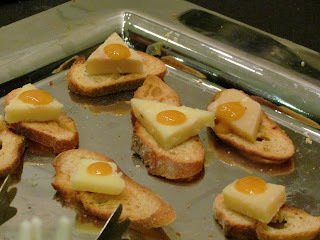 The cheese was Blue Mont Reserve and dressed perfectly with a dollop of honey. Farm Fromage had a couple cheeses to sample, including the Jean-Louis seen below, potentially the strongest cheese we've ever had. Needed a drink asap (which were conveniently everywhere!). On the dessert front, The Bent Spoon from Princeton partnered with a couple local breweries to create three delicious ice cream flavors. 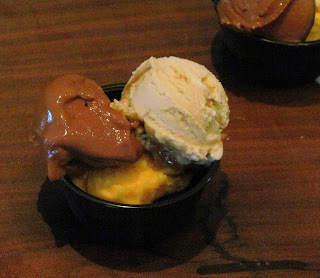 The dark chocolate Yard Bourbon Love Stout using Yards beer and the Troegs Nugget Apricot Nectar Sorbet were my favorites. 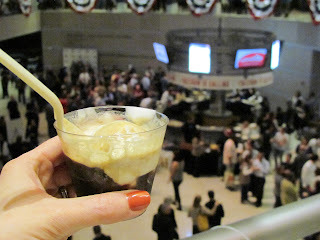 Triumph Brewing Company and Franklin Fountain also combined their beer and ice cream to make little root beer floats. They were deeee-lish. 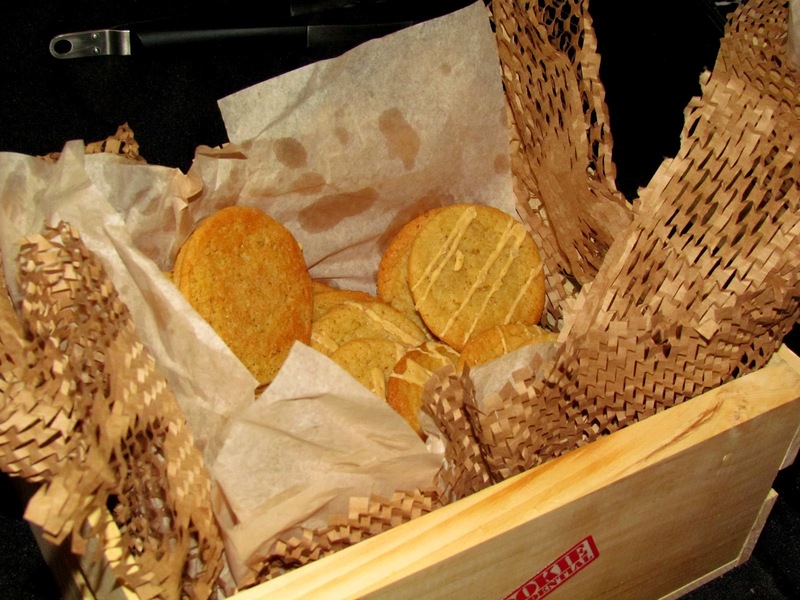 Cookie Confidential in the speakeasy section of The Brewer's Plate had all sorts of cookies flavors, including cheesestake and garlic dulce de leche. The latter was actually fantastic. Some guy near us thought he was pretty hysterical by calling the owners "mad scientists" several times, which was actually kind of true. The "Get After It" Award goes to The Night Kitchen Bakery. Their table was hidden back in the speakeasy section, so with an hour left their started walking around the main Constitution Center floor with a serving plate of mini-cupcakes. Smart move! and great cupcakes! 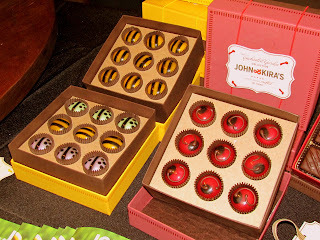 The people at the John & Kira's chocolates table were super nice and the only ones to ask why we were taking so many photos. Their chocolates were excellent and would make a nice gift idea. 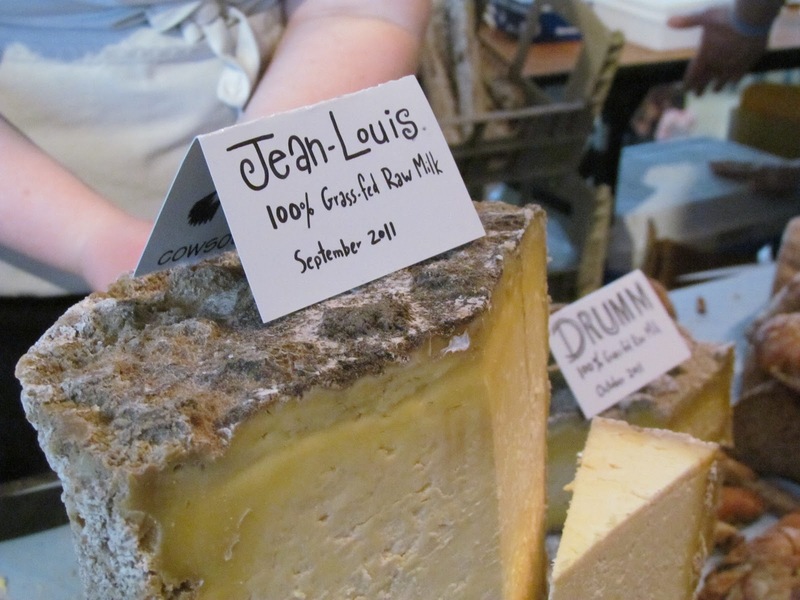 They have a table at the Rittenhouse Farmer's Market year round, as well as several other markets during the year. 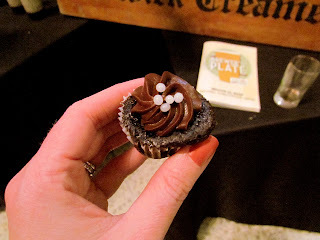 Did you attend the Brewer's Plate? Tell us your favorites. 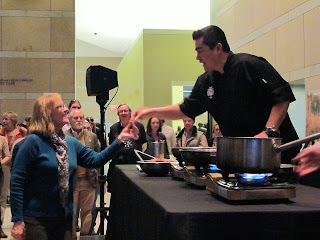 If you didn't attend, share with us some of your favorite food and beer pairings. We'll compile comments and post on Twitter and Facebook.